There are a hundreds of good reasons to visit Spain’s elegant, exciting capital city. My favourite? The food and drink. From street-food markets to traditional cafeterias, incredible Spanish produce to the sweetest treats, there’s something for everyone. 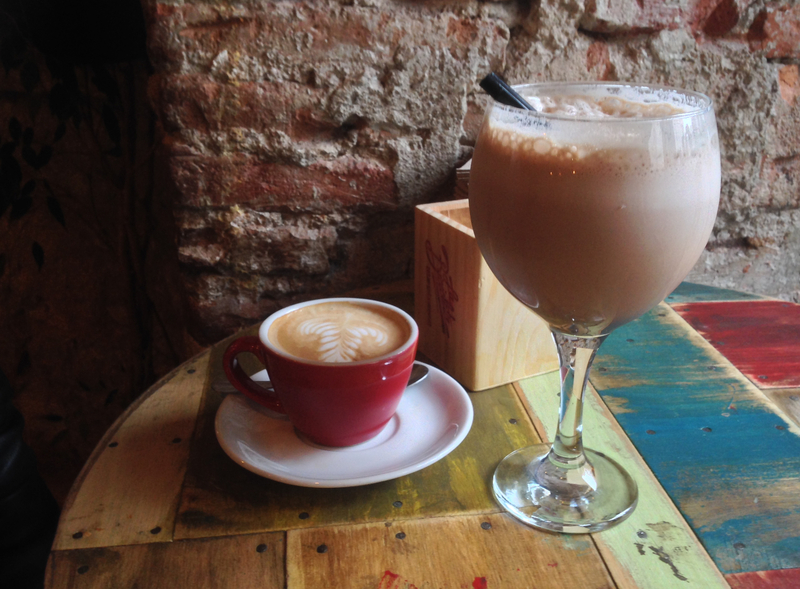 Authentic tapas, cafe con leche, market life, Madrid’s a delight for the senses. Madrid might just be my favourite city to eat in. There are plenty of other reasons to visit the Spanish capital, and there are plenty of other cities reknown for great food, but there’s something about this place I just love. It’s informal, it’s fun and it’s delicious. Eating in Madrid is all about enjoying food with friends, embracing Spanish classics and sampling some of the best quality produce you’ll find anywhere in in Spain. When we spend a few days in this beautiful city last spring, we couldn’t help but stumble across fabulous food wherever we went. Here’s my guide to off-piste eating in Madrid, one tapas at a time. There are are many wonderful breakfast treats to be enjoyed in Spain, from sharp freshness of pan con tomate to pillow-like tortilla. But the most indulgent of all is a plate of steaming hot churros straight from the the fryer, accompanied by a cup of thick, dark chocolate and a sweet cafe con leche. These crisp little fingers of dough, liberally sprinkled with sugar, taste divine and – for me – will forever taste of Spain. You can enjoy churros from stands all round the city. But nothing beats the authentic way, sat at the bar of a cafeteria on a chromed stool watching the ebb and flow of regulars popping by for their morning coffee. These little cafes can be found all across the city, and whilst they’re not always glamorous they’re about as Spanish as it gets. Don’t be put off if you’re not on two wheels, or the pictures on the wall don’t mean anything to you. This charming cafe may just be the answer to every cycling fan’s dreams, but it’s also home to the best coffee I tasted in Madrid. Pitching itself as a cafe/workspace/bar it’s actually a cosy bar and lounge with a menu that leaves the mind boggling (Lance Armstrong sandwich anyone?). We popped in for morning coffee a few times, and on an evening for a few beers. It’s a wonderful place to idly sit in the front window and watch the world go by in the little square outside. Whether you happen to be a pro-cycling fan or a lover of coffee, I’d rate La Bicicletta as one of the best stops in Madrid. 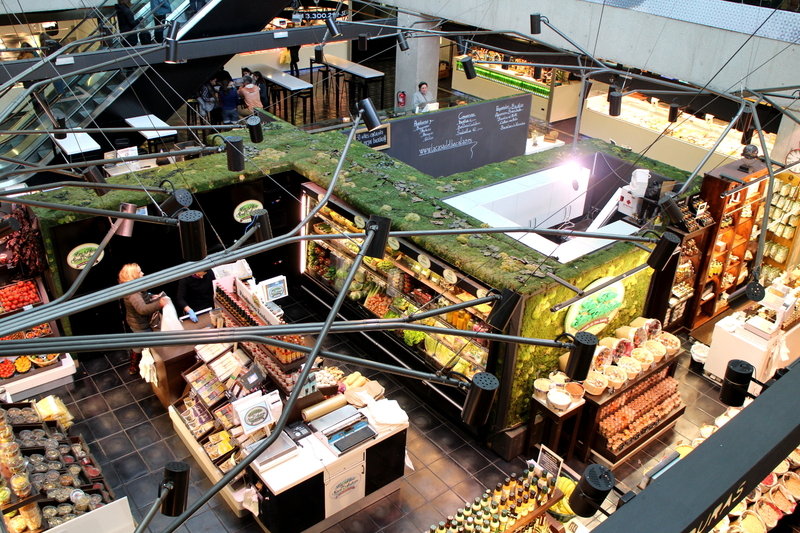 If you want to sample Spanish delicacies and pick up some of the highest-quality produce you can find in Madrid, you’ll love the San Anton market. Spread across several floors with a central atrium, the building alone is a good reason to visit. You’ll find delicatessens on the first floor, regional tapas from around Spain on the second and a rooftop restaurant on the third. We stopped here for tapas and a drink, and wished we had a kitchen to enjoy more of the mouthwatering cured meats, cheeses and rainbow-coloured vegetables on display. 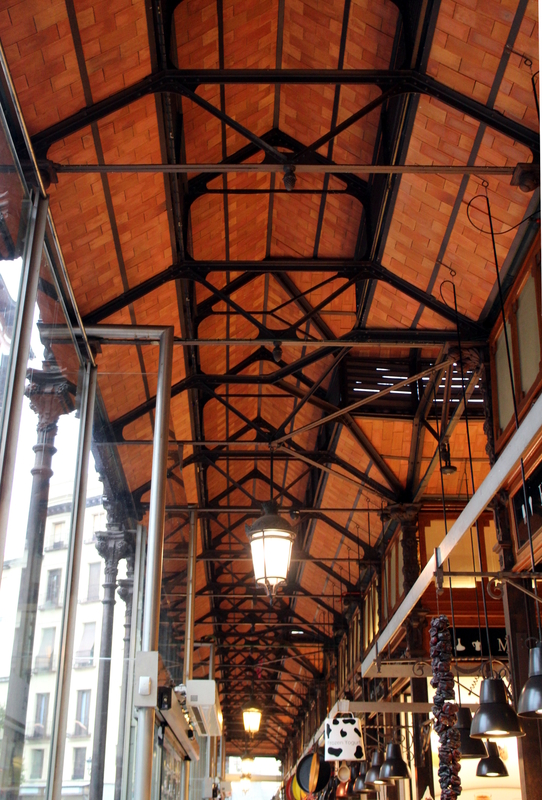 Situated in the upmarket district of Salamanca, la Paz is a taste of authentic Spanish market life. It’s packed with stalls selling every imaginable grocery as well as great value cafes and bars. It’s not instagram-worthy and it’s not tourist-friendly (we had to practice our best Spanish here) but it is a wonderful slice of real-life, real food. Towards the back you’ll find a little cafe specialising in empañadas. Now I’m not entirely sure what was in mine, but it tasted heavenly – so if you find yourself nearby and hungry, stop by. Walk just a minutes from Plaza Major, and you’ll find this beautiful building. Recently restored, the brick archways are packed with high-end food stalls, stylish tapas bars and seductive cafes and patisseries. Yes, it attracts much of the tourist crowd, but don’t let this put you off. It’s still a delight for the senses. Head here early in the morning or later in the day to miss the crowds and sample some of the diverse tapas on offer. Our absolute favourite. 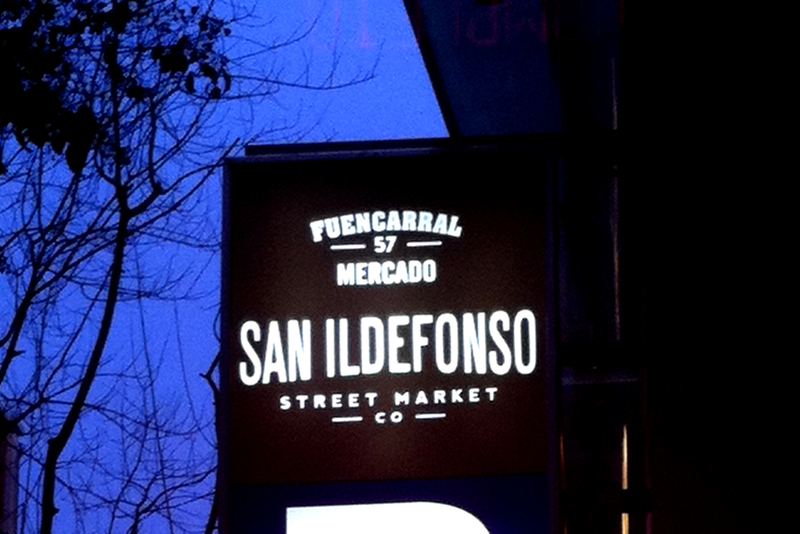 Less traditional, more street food market slash entertainment space. Once you’re up the stairs, the market opens out into large entertainment space, with little tapas stalls forming a perimeter around the central eating area. It’s best on an evening. Grab a beer or two, take your time to try the different tapas cooked fresh in front of you and enjoy the atmosphere and entertainment. When we visited, we were equally delighted, amused and confused by a stand-up comedy night taking place in the central space whilst we devoured our endless plates of jamon, brochettes and more. When we weren’t eating our way through the delights of Madrid’s markets, you could find us on Cala Baja in La Latina district. This area has a reputation for being the one of the best spots for tapas in Madrid and we most definately agreed. The busy street is packed full of bars, ranging from the slightly touristy to the very local. We found some great little places we’d happily go back to again and again – the sort with nowhere to sit down and packed with locals. Pick the right bar you’ll find cold beers, free (and delicious) tapas and a lively atmosphere. We didn’t head to Madrid with the intention of making our trip an edible adventure. But it’s hard not to when there are incredible places to eat and mouthwatering displays of produce around every corner. The real joy of the Spanish capital is breaking free from restaurants and seeking out busy little bars, old-fashioned cafes and cavernous markets. It’s exciting, fun and exceedingly delicious. Where are your favourite places to eat off the beaten path? With big thanks, as ever, to Ben for sharing some of his photos here. Yess!! This is how I travel too – eating my way around a place! Totally need to visit Madrid and keeping your post in mind for when I do! This looks so ridiculously delicious – all going on the list for next time I get to Spain! I spent three weeks in southern Spain and the food was one of the most satisfying parts of my stay. 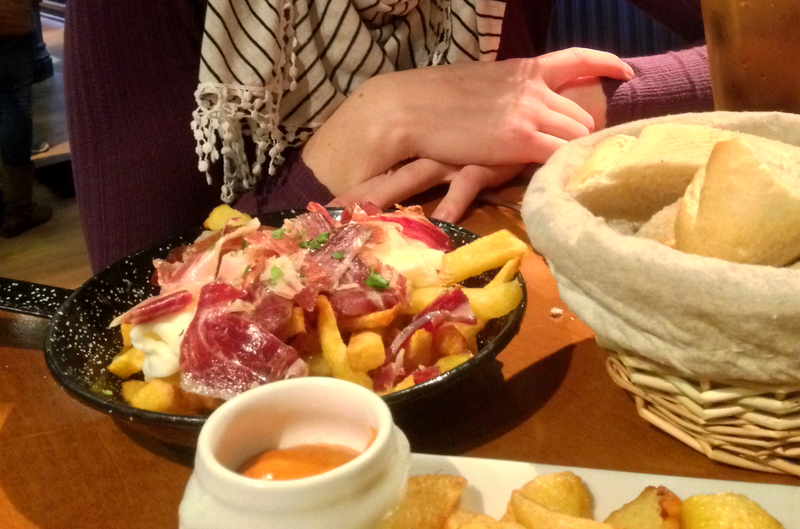 It was cheap and delicious, and I just LOVED the tapas culture. I loved getting small finger food with my ice cold beer. I haven’t been to Madrid yet, but I would definitely love to check it out one day. Spanish food is wonderful isn’t it? I was worried that it might be hard to find authentic tapas in the capital, but I needn’t have been. Much as I am hugely envious of your three weeks in Spain, I’d really recommend Madrid if you can make it in that direction again. I think it’s a hugely underrated capital. Hey Alice .. thanks for this post. I’m off to Madrid next month, and haven’t really had many places pegged to visit (I’ve been focusing on researching Barcelona and Seville) .. so these little gems are a find! They all sound fab and I can’t wait to add them to my itinerary. Hope you have a fantastic time Jay, we loved Madrid. Most of these places we stumbled across, so I have every hope you’ll also stumble across some more good finds. That’s the wonderful thing about Spanish cities, there always seems to be more great bars and restaurants to try around every corner.